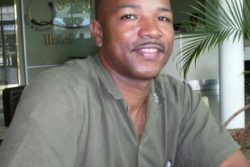 An Angoy’s Avenue, New Amsterdam youth, was chopped to death a short distance away from his house on Wednesday evening. Dead is Carl Mc Donald, also known as “Carly” and “Danno”, 25, of Patrick Dam, Angoy’s Avenue. A post-mortem examination carried out yesterday revealed that Mc Donald died as a result of the single chop he sustained, which entered his chest. His mother, Laurain Mc Donald, yesterday explained that her son left home around 6.30 pm on Wednesday to attend a BBQ event, which was being held several houses away. However, she relayed that about 30 minutes later, her nephew ran home to inform the family that, “Carly get chop and he fall overboard”. 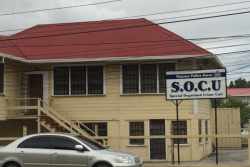 The woman explained that on Christmas Day, one of the deceased’s cousins and the suspect identified as “Chase”, were involved in a heated argument over a female, which became physical. 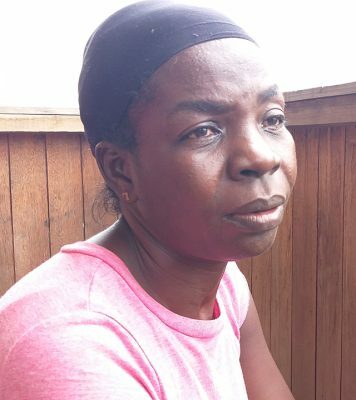 “I hear he (suspect) come back last night with a cutlass but I wasn’t on the street so I don’t know what happened”, the woman relayed. However, the inconsolable woman stressed that her son at no point had any issue with the suspect. The police in B Division were on the hunt for the suspect up to press time yesterday. However, according to a police source, one person, who is suspected to have given the main suspect the cutlass which was used to carry out the murder, is in police custody for questioning. 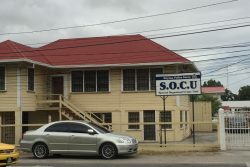 Meanwhile, a cousin of the deceased, Troy Caesar, 20, who witnessed the murder, stated that on Wednesday he was heading to the BBQ when he saw his cousin (the deceased), heading towards him. “We hear them man get lil vibes so me and he (deceased) stand in the corner then I see the man fire a chop at me and I run back. I see Carly stand up in the corner and the man run to Carly and chop he and Carly throw a bottle but the man duck and we run back to go. Then the man throw Carly overboard,” he recalled. The emotional lad explained that he immediately plunged into the trench in an effort to rescue his cousin. “We pull he up and them say blow he in he mouth; me aunty do it… He did breathing”. 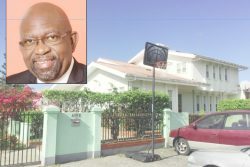 However, Mc Donald was pronounced dead on arrival at the New Amsterdam Public Hospital, where he was taken on Wednesday evening. Mc Donald, a father of two who worked in the interior, was known to be a helpful lad in the community. Residents of Angoy’s Avenue yesterday called for more policing within that community. “This boy Chase every time he family in a fight, he mother does run and bail he and settle story. The police them need to come an look into these things”, one villager said.